First Step Sports Development are pleased to announce that thanks to our continued partnership with Street Games our much loved Doorstep Sports North club will be returning for not just 1 new weekly session but 2! This springs sessions ran for 14-25 year old’s will be held at Courts Community Centre on Courtway Road in the HU6 area of Hull. 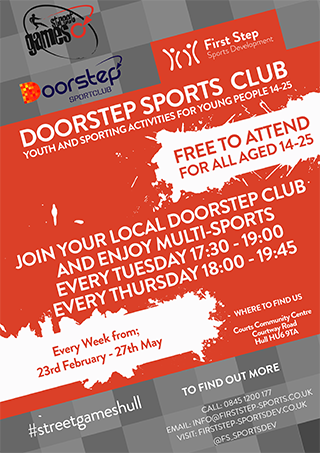 So if you’re looking for free, exciting sporting activities to attend Doorstep Sports is the club for you!